From the time of its founding in 1836, Fayetteville, Arkansas, served as an important transportation hub between established eastern centers and newer settlements to the west. Nestled in the Ozarks of northwest Arkansas, Fayetteville grew along the foothills of the Boston Mountain Range. To the east lay the great urban centers of Memphis and St. Louis, and to the west, the vast and often contested lands of the southern plains. The original settlers of Fayetteville found themselves less than thirty miles from the border of the newly established Indian Territory, where the first arrivals from forcibly relocated eastern tribes had already begun to reconfigure the region's political and economic landscape. Serving as one of the westernmost outposts of Euro-American settlement, the town of Fayetteville was an important stop for westward travelers. The numbers of migrating settlers increased dramatically in the mid-nineteenth century, with the 1848 annexation of Mexico's immense territories in the Southwest by the United States and the California Gold Rush of the same year. The dawn of the railroad era brought to town many lines heading to the West, which provided a major boost to the local economy as goods and passengers steamed through the town. In 1871, Fayetteville successfully petitioned to host the state’s land-grant university, originally founded as Arkansas Industrial University. Mathias Cohn, a prominent Jew and elected official from Augusta, Arkansas, was co-chairman of the site selection committee. Later renamed the University of Arkansas, the institution established Fayetteville as a regional seat of higher education and attracted many new residents to the area. Jewish settlers came to Fayetteville in the mid-19th century, forming the beginnings of a community that lasts to this day. Fayetteville and much of the Ozarks never saw the same numbers of Jewish merchants as the areas of Eastern Arkansas closer to the Mississippi River. The earliest recorded Jewish settlers in the area were the three Baum brothers, Joseph L., Leopold E. “Lee,” and Moses. The Baums immigrated to St. Louis from Prussia near the close of the Civil War. While peddling along the military road to Fort Smith they passed through Fayetteville and found it an ideal location to settle and establish their business. 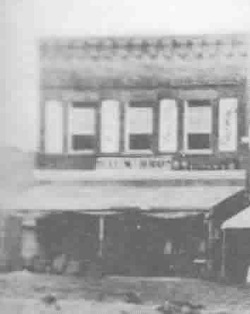 In 1865, they opened a clothing and general merchandise shop in the town square that had been destroyed during the Civil War, and saw rapid success as the town quickly rebuilt. Within three years they upgraded to a larger building, and by 1870, Moses Baum, at the age of twenty-four, was listed as one of the wealthiest property owners in town. Moses found himself successful enough to begin raising a family. In 1869 he married 18-year-old Julia Heller of St. Louis, and the couple went on to raise eight children in Fayetteville. For many years the Baums remained the sole Jewish presence in the area. The community began to grow in the early decades of the twentieth century, as the twin engines of the Fayetteville business environment and the University of Arkansas attracted Jewish newcomers. In 1919, Louis Silverman opened a jewelry store which soon expanded to include high-end clothing. Louis, his wife Dorothy, and son Bernard had moved to the town from Kansas some years earlier. Another recent arrival, Julius Waterman, claimed the distinction of being the first Jewish faculty member at the University of Arkansas in 1914. He was instrumental in establishing the Law School, of which he was named Dean in 1924. He ultimately rose to become vice president of the University, and declined an offer to serve as president when the position became available. At this time, Jewish students maintained only a modest presence in the institution. In 1920, the university took a religious census, and found a total of three Jewish students among the 708-strong student body. In 1937, fewer than ten Jews lived in Fayetteville. Opportunities for communal fellowship were scarce for these few Jewish residents in Fayetteville. 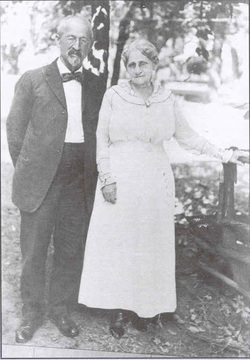 In their early years of religious solitude, Moses and Julia educated their children at home in Jewish values and traditions, and the Baum store closed every year for the High Holidays. As Jewish enrollment at the university began to rise, both the Silvermans and the Baums embraced the students, who often ended up enjoying a Friday night Shabbos dinner at the Baum residence. In the 1920s, the Baums began holding services in their home with the assistance of Samuel Teitelbaum, rabbi of the neighboring congregation in Fort Smith. Even as the fledgling community grew, Jewish residents maintained an active role in the broader Fayetteville society. In 1912, when the wives of local businessmen established a charity named the Relief Association and Thrift House, Dorothy Silverman served a prominent role in the project. Moses Baum was a charter member of the local Masonic Lodge, and both he and his wife contributed significantly to the first local hospital. Leopold Baum, who never married, also played an active role in the Fayetteville community, contributing to local high schools and serving as a director of the Electric Light and Power Company. By the late 1930s, the campus presence was large enough for Teitelman and Baum to help students organize a Jewish Menorah Society, which soon joined the Hillel Foundation. Except for a period of dormancy in the late 1950s, the Hillel grew along with the increasing numbers of Jewish faculty and students. The Hillel Jewish Student Center occupied rented spaces until 1975, when a house was purchased on Storer Street. Two families, Mort and Norma Gitelman and Joe and Phyllis Rosenberg, guaranteed the mortgage and provided financial stability for the new center. The range of communal offerings also diversified with time. Residents founded a religious school in the late 1960s, conducted by dedicated community members Norma Gitelman, Phylis Rosenberg and Gene Tweraser. In 1973, Neil Gitelman, Mort’s and Norma’s son, had the honor of being Fayetteville’s first bar mitzvah. The close-knit community also organized fundraisers, seders, and a women’s group. By the late 1970s, lay-led services met on a weekly basis. As the community grew, the lack of a local rabbi and a formal congregation became an obstacle to Jewish residents seeking regular religious services. For many years, the Silverman family traversed the Boston Mountains to attend services at the Fort Smith synagogue, sixty miles south of Fayetteville. Through the 1960s and 1970s, increasing numbers of students and family members joined their pilgrimage on the High Holidays and other occasions. In January of 1981, residents met at the home of Joe and Louise Rosenberg, and voted to establish a congregation, which they named Temple Shalom. The decision did not come easily, as many members feared that a new congregation would supplant or compete with the already existing communal functions. Recent years have brought extensive growth to the Fayetteville region. Business titans such as Wal-Mart in nearby Bentonville, Tyson Foods, and J.B. Hunt Transportation Services have brought an influx of capital and residents to the region. A special census conducted in 2006 revealed that the Fayetteville population has grown nearly 20% since the year 2000. In a 2007 report titled “Best Cities for Doing Business” Inc. Magazine ranked Fayetteville number four in the top-twenty mid-size city category. The Jewish community has grown as well, with 175 Jews living in Fayetteville in 2001. A synagogue. The community now sustains a congregation, with members from Fayetteville, Bentonville, and the surrounding areas: Temple Shalom of Northwest Arkansas is an ISJL education partner community, employs a rabbi part-time, and has a very active membership.